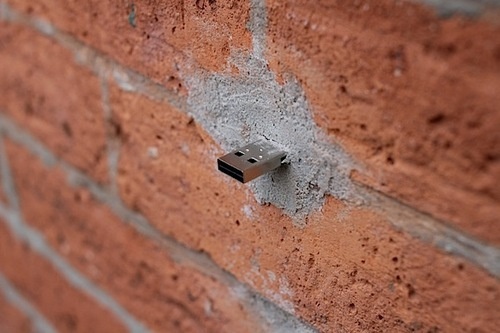 Across New York, there are USB drives embedded in walls, buildings and curbs. 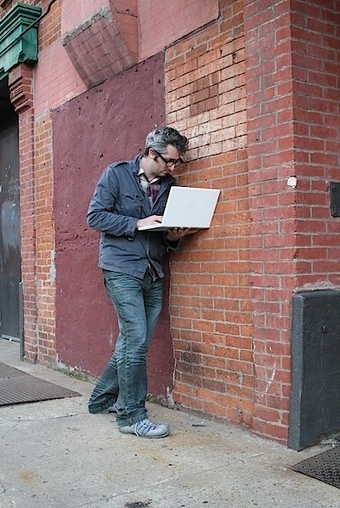 The idea is to create an anonymous, offline file-sharing network in public space. The drives are completely public and anyone can plug in to drop and download files. Seriously, you can plug the USB drive into your laptop. Like that guy right there. Sports helped get HDTV into the mainstream. Fact. It was thought sports would do the same with 3D. Who wouldn’t want to see career-ending helmet-to-helmet hits in the third dimension? A lot of people, actually. ESPN 3D is a flop. We’re now halfway through ESPN’s one-year 3D trial run and nothing’s happening. Money’s certainly going into the medium, sure, but the trouble is nothing’s coming back out. 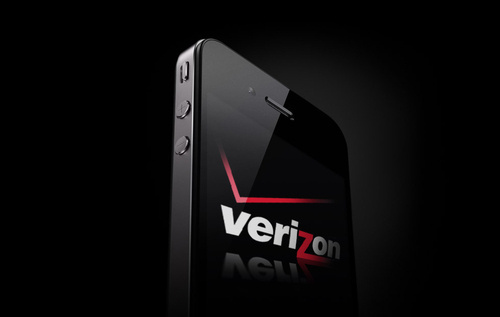 Can’t wait for a Verizon iPhone? No problem—you can get one now. Cheaper than AT&T’s borked handset, too. Yeah, we’re being creative with the term “iPhone,” but who cares. It works. With an iPod Touch in your pocket and a MiFi in your bag, you have a fully-functional, always-connected iOS device talking to the world over the Verizon Wireless network. Sure, it’s technically a hack, you won’t be able to send an MMS (just like the old days! ), and you’ll need to use a couple extra apps—but your reception will almost definitely improve, and the total monthly cost will be a good chunk lower than an equivalent AT&T plan. 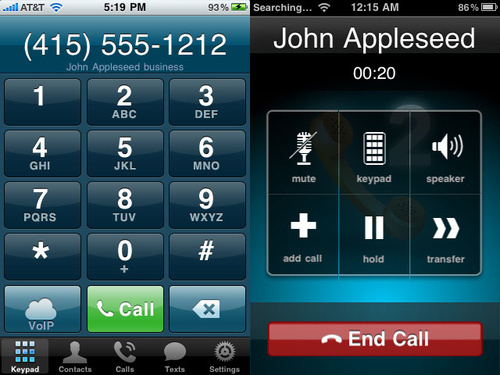 • Get A Number: FaceTime, Fring, and Tango are great ways to keep in touch, but they aren’t ubiquitous enough yet. Try Line2, a $10/month service that gets you your very own phone number plus unlimited VOIP calls and texts within the US and Canada. You could also use Skype, but you won’t get the free text messages. 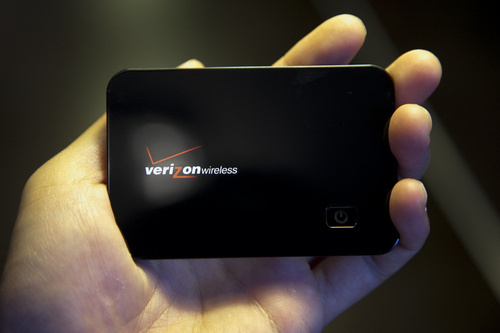 • Get Coverage: Verizon’s MiFi will give you enough bandwidth to jaw off anywhere the company’s EVDO fingers touch. Which is pretty much everywhere. If you’ve got a hankering for 4G, and live in one of the markets that supports it, you can also go with the zippy Sprint Overdrive. 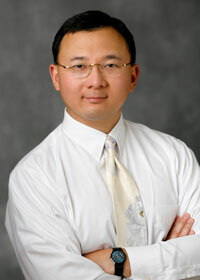 • Get Headphones: The iPod Touch has one setting: Speakerphone. Do everyone a favor and buy a headset. The primary downside to the iPod Touch Phone is that it can’t send or receive MMS messages. Sadly, there isn’t a perfect way to simulate this experience yet, so any naughty photos or videos will have to be sent the old-school way: Email. But who cares? We survived a couple years with MMS-less iPhones before, and we can do it again. Remember when BP was responsible for horrible things, and then they plugged the hole and we moved on to worrying about other horrible things? Things are still horrible! The chemical they used to break down oil is making people ill.
Al Jazeera investigated the current chemical state of the Gulf, and found that the at least 1.9 million gallons of dispersant BP used to fix the spill have combined with crude oil to make something worse—which is washing ashore and causing a lot of human sickness. As the oil breaks down, poly-aromatic hydrocarbons (PAHs) are being released—chemicals Al Jazeera identifies as “arcinogenic, mutagenic, and teratogenic.” Think of this as releasing a pack of foxes to attack a beehive, and then the foxes come back covered in bees and jump all over you. And it’s going to be hard to avoid this stuff, says one expert. “The dispersants are being added to the water and are causing chemical compounds to become water soluble, which is then given off into the air, so it is coming down as rain, in addition to being in the water and beaches of these areas of the Gulf,” explains Bob Naman of the Analytical Chemical Testing Lab in Mobile, Alabama. Can you remember the day when Apple’s audacious plan to sell 10 million iPhones in its first year was greeted with extreme skepticism within the cellphone industry. Now the computer company is shipping 14.1 million handsets every three months according to the latest IDC numbers, moving Apple into fourth place on its Top 5 list of mobile phone vendors worldwide. That moves Apple ahead of RIM thus confirming a Steve Jobs boast made during Apple’s Q4 earnings calls. Sony Ericsson has been pushed off the list for the first since 2004 when IDC began tracking the top 5 vendors. But that’s not the only interesting bit of information we see in the IDC numbers tallying all cellphone shipments, not just smartphones. Overall market leader Nokia, slipped from a 36.5 percent to a 32.4 percent market share since the same quarter last year. IDC notes that Nokia is starting to show some weakness in emerging markets, one of Nokia’s last strongholds, with smaller regional handset makers starting to grab market share away from Espoo in Asia/Pacific and Latin America. It’s not doing well in smartphones either, with IDC claiming that Android devices are gaining momentum at Nokia’s expense. LG is also suffering with a 10.1 percent decline in shipments since the same quarter last year, dropping from 10.6 percent to an 8.3 percent market share globally. Read the full report after the break. 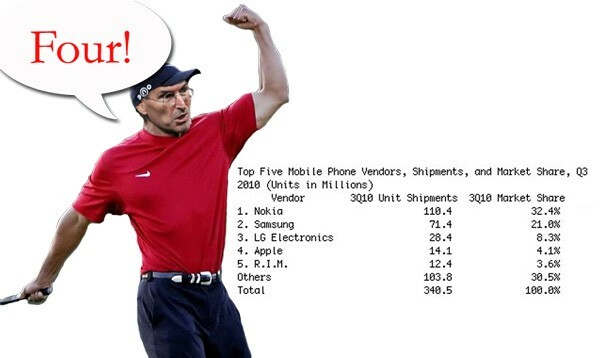 IDC: Apple passes RIM to become fourth largest mobile phone vendor globally as Nokia, LG, and Sony Ericsson struggle originally appeared on Engadget on Fri, 29 Oct 2010 04:05:00 EDT. Please see our terms for use of feeds. Apple’s war on Flash appears to be working. At the start of the year, only 10% of all web video was available in HTML5 format. Today, 54% of all web video is. What’s changed between January and today? The iPad was released to the world, selling millions of units. (Flash video doesn’t work on the iPad.) Also, smartphones continued to gain in popularity. Most smartphones don’t play Flash video, though that’s starting to change. If publishers want their videos to play nice with these new mobile devices they need to be HTML5 compatible. After a brief play Place Search looks like something I’ll be using a lot. It grabs all local services and venues when a search request is made (such as “South London gyms”), displaying all relevant info on the first page. 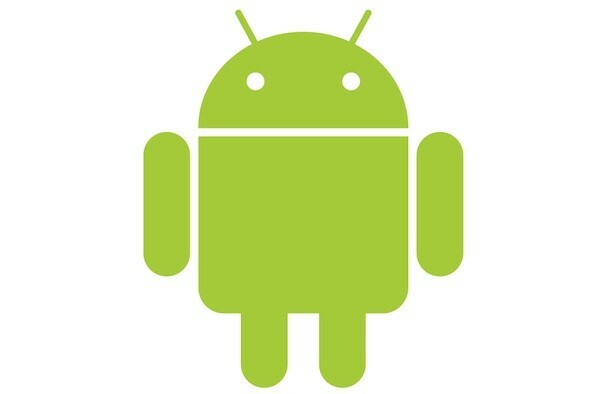 Google exec calls Android acquisition its ‘best deal ever’ originally appeared on Engadget on Wed, 27 Oct 2010 20:58:00 EDT. Please see our terms for use of feeds. You didn’t forget did you? Today’s the day that the WiFi-only iPad makes its inaugural appearance at Verizon. Whether it’s the beginning of better days between the two US giants remains to be seen. As a reminder, Verizon’s offer bundles a MiFi 2200 mobile hotspot with your choice of 16GB ($629), 32GB ($729), or 64GB ($820) iPads and 1GB ($20), 3GB ($35), or 5GB ($50) of data per month without contractual commitment. Of lesser interest is the fact that AT&T will also begin selling the WiFi + 3G version of the iPad today in 16GB ($629), 32GB ($729), and 64GB ($829) with contract-free data plans for 250MB of data ($14.99) or 2GB of data ($25) per month with free access to AT&T’s 23,000+ domestic WiFi hotspots. AT&T’s also offering international plans ranging from 20MB for $24.99 per month on up to 200MB for a staggering $199.99 per month. Hit the appropriate source link below if either of these offers tickles your kraken. 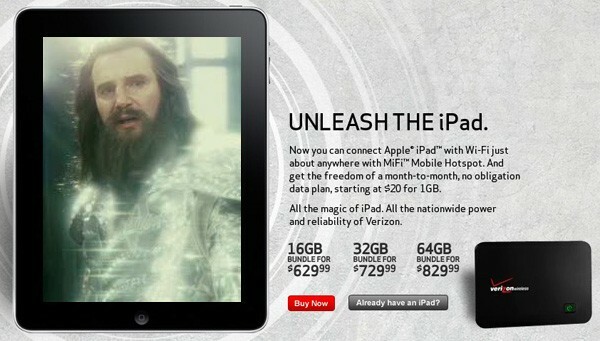 iPad now on sale from Verizon Wireless and AT&T originally appeared on Engadget on Thu, 28 Oct 2010 06:51:00 EDT. Please see our terms for use of feeds. The time it takes to go from wanting something to signing into PayPal and buying it might be just enough for you to change your mind. Which is why PayPal just cut out that step, allowing in-app and in-site buys. If you’re in a game, or on a web page, you no longer have to leave to use PayPal to fund your purposes. Instead, using a new tool the company just introduced, you just have to click on the pertinent link. That will trigger a PayPal pop-up, through which you approve the transaction. All without ever having to leave Farmville.